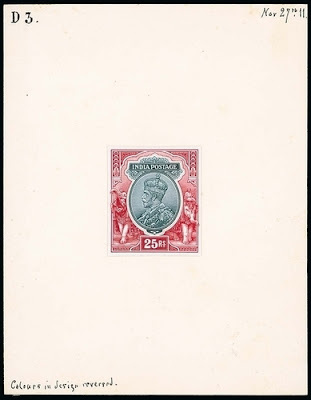 One of my favourite sets of India are the King George V definitives. I love their imperial feel, the beautiful frames and the portrait as well. The high values, in particular, are rather pleasing to the eye. 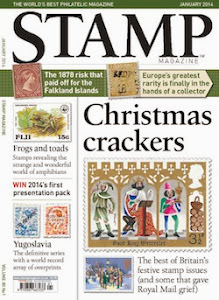 I’ve already been gushing over them in a full-length feature in Stamp Magazine (June 2010), but they haven’t lost any of their appeal to me yet. I was therefore very happy to see so many gorgeous items from that set coming up for sale in a future auction. Although mainly, if not completely, out of financial reach for me, one is allowed to dream, and dreaming is what I have been doing of them lately. Take a look at this beauty, for example. 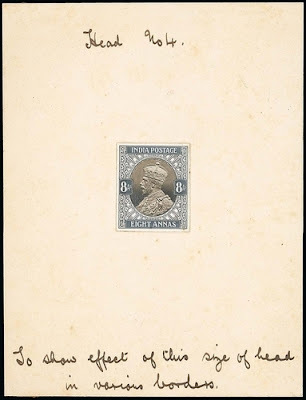 Not for India the well-known and often-used stamp portraits of King George V. No, the jewel in the imperial crown was to have its own tailor-made portrait and this composite photographic essay was part of the attempts to find the right size for it. Eventually a larger-sized head was chosen. This 'Head No. 4' is shown in this second essay, which is part of series trying out various frames. The high values, too, needed a bit of forethought. Here’s an example of how the concept of various Indian landmarks might be incorporated into the frame. 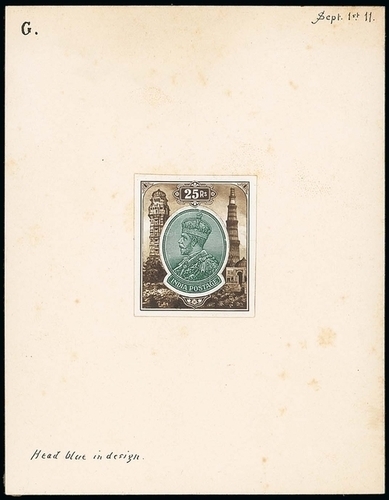 This composite type shows Vijay Stambha or the Victory Tower in Chittorgarh Fort on the left of the King and the Qutub Minar in Delhi on the right. I must admit I’m glad they eventually opted for the elephant design, which, together with an improved medallion for the King, makes for a stunning stamp. It’s great to see, too, that even the elephant design was tweaked. Note how the position of the right elephant’s trunk changed from slightly up to slightly down on the die proof of the final frame. It’s amazing that details like that are brooded over! 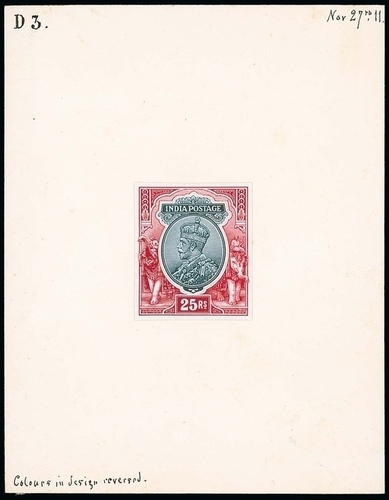 There are many more George V items in the auction but there was one other lot which immediately grabbed my attention. It is from a later, post-colonial period. 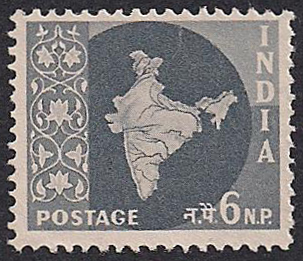 In 1957 a set was issued which had the Map of India for its design. To be honest, it took me years to finally realise it was a map, rather than a bit of root ginger, which it really resembles, I think. But anyway, the set never had any high values, and when rupee value stamps were needed, the Indian postal authorities reverted to those issued earlier in the 1950s. But apparently there had been plans for a high value accompaniment to the map series, as becomes clear from these essays. Aren’t they gorgeous? Does anyone know why these were never issued? I think they’re quite splendid and they would have been such an asset to this set. 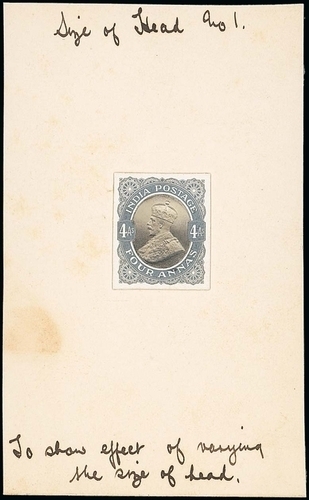 In fact, I wish they had gone for this design for the whole set as it seems a much more upmarket design, although the existing stamp has its own innocuous, unobtrusive charm. These are gorgeous, and I'm so glad you showed them. Cannot believe you thought the map of India was ginger though! I don't know much about post-Partition India, but isn't it possible that map was likely to change as disputed areas were argued or fought over? That was one of the things I thought as well. But the high valuer map seems to resemble that on the issued stamp, so either there is another reason or these essays date from later during which time some changes to the maps were maybe anticipated. I thought the "map" looked like a piece of washing being blown about! I believe I've created quite a puddle here! Many thanks for sharing these spectacular images of essays. 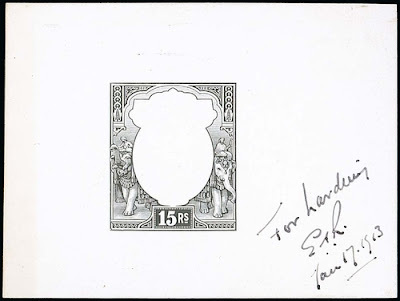 Even most philatelists in India itself are unaware of such issues..